I have a full review on BibRave.com, but I wanted to tell you something I learned that day: The Dallas Half Marathon reminded me I’m still strong. It’s been a long road back to running. Honestly, there were days when I was sure I’d never do it again, and getting back to the starting line of a half marathon felt like an impossible goal. My training was specific though. I ran four days and cross-trained another day. I worked in strength training once a week. I built my mileage slow and let myself take walk breaks if I couldn’t push through those long runs. That morning, I stood with a couple thousand other people in my corral and bounced to stay warm. I rubbed my hands together and fixed my headphone cord again and again. I stepped over the starting mat and smiled as I took off. I knew somewhere my friends and family had been notified via their smartphone that I had started the race. Each time, I passed one of those electronic mats, I knew they’d be getting an update. I was so thankful for that support. Honestly, those first few miles felt slow. I was cold (I had a jacket but I shed it early in the corral because everyone around me was doing it— peer pressure!). By mile 4, I had found my rhythm and my pace was exactly where it needed to be. I planned a water/fuel break at mile 6 and then saw my sweet husband at mile 7. He high-fived me and I ran on with his smile in my mind. I picked up the pace and finished strong— gaining speed with each passing mile. The crowd was amazing. The race was never boring. There were creative signs and people passing out Starburst candy and free hugs, and it was so inspiring to be among them. When I came to the finish line, I saw my friends waving at me. I rolled through the finish line and when I got a chance to hug them all, I hope I thanked them enough. These were the people who listened to me wonder and dream if another half marathon was possible. They sent me texts and checked on me and prayed for me, and here they were, on a Sunday morning, in downtown Dallas, to congratulate me. Love your people who love that you love to run. They make moments like this possible. Around mile 9, we split off from the marathon pack and I looked over to their lanes. Could I do that one day? I don’t know what’s next for me. 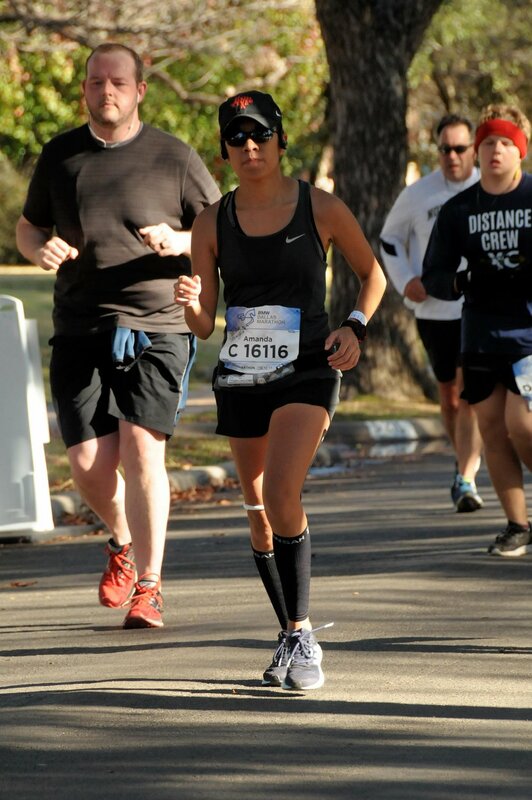 I know the half marathon is a fun and testing distance, and I’m pumped to go at it again. And one day, maybe a marathon. For now, what’s a half marathon I just have to run?